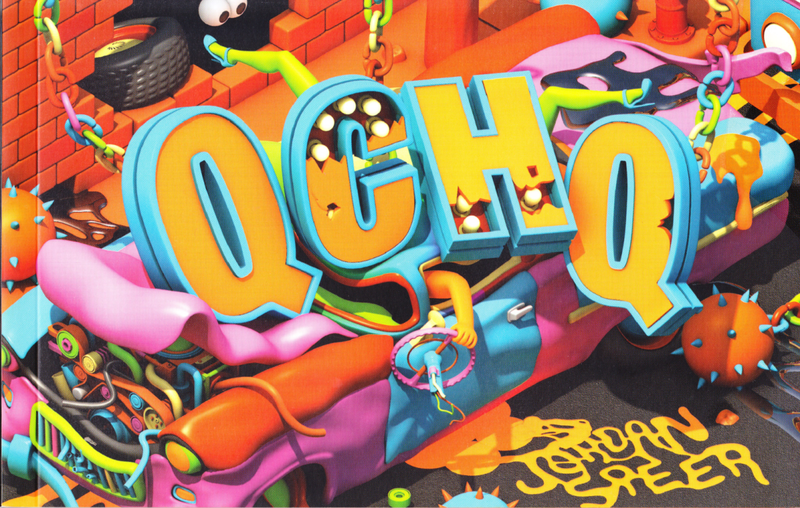 Jordan Speer’s QCHQ from Space Face Books looks relatively strange and uninviting – its fluorescent coloring, relative lack of structure, and unique illustration style would have likely caught my eye at a convention but I doubt I would have purchased a copy. However, being part of a subscription means getting every book a publisher puts out, which in turn, puts you into contact with books that challenge your comfort level as a reader and puts into your hands books you would have never purchased on your own. In this case, I’m glad for the challenge. Speer’s QCHQ focuses on the QCHQ company’s quarterly report, with hokey presentation slides with Comic Sans text and strange bolding choices give the official spin on a world that seems to be dying under the weight of its god-client. 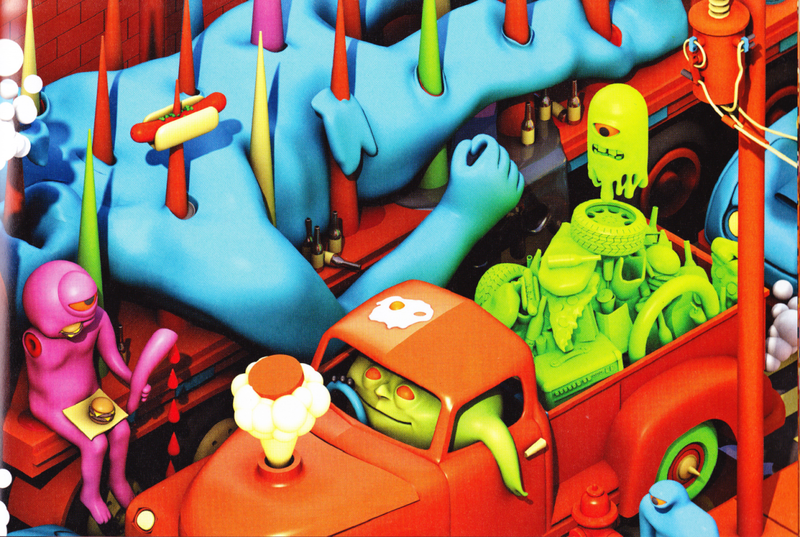 Speer’s characters and illustrations are rubbery, designed to look like the most advanced graphics of the 90s in lurid, plasticine detail. Demonic blood drips and oozes, dissected frogs lay casually on kitchen tables, and corporate-sponsored blood sport is mentioned in the same breath as quarterly earnings. QCHQ pulls a lot of reference from 90s computer culture. There’s the illustration style itself which harkens back to the low-poly designs of various computer games from the time, plus the low-tech slide show that looks like it was built with the first version of Powerpoint. 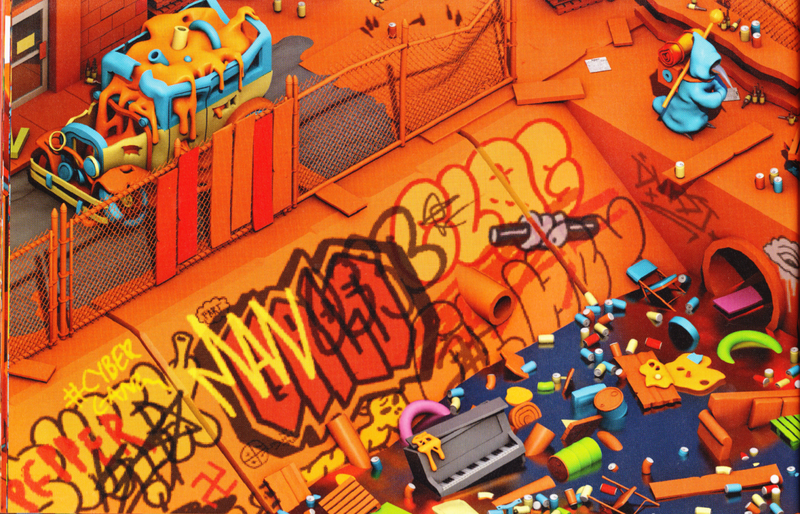 But Speer draws from the present, with technical artifacts like slide-lock USB keys, green screen special effects suits, and hash tag graffiti. The resulting mix is something of an anachronism. In part, Speer seems to be talking about corporate culture as a whole – its unnatural behavior, its relative lifelessness, and backroom deals that are made at the highest of high circles. QCHQ shows the real-world (as real as can be possible in this book) consequences of corporate behavior, and the results are gruesome. Speer also seems to be particularly interested in outsider observation. One remarkable illustration is of a giant satellite with fists holding the thing together, all made up of mechanical eyes and ears. Surveilling googly eyes grace many pages (even the cover), and so do cameras. The feeling of being watched is constant throughout QCHQ. 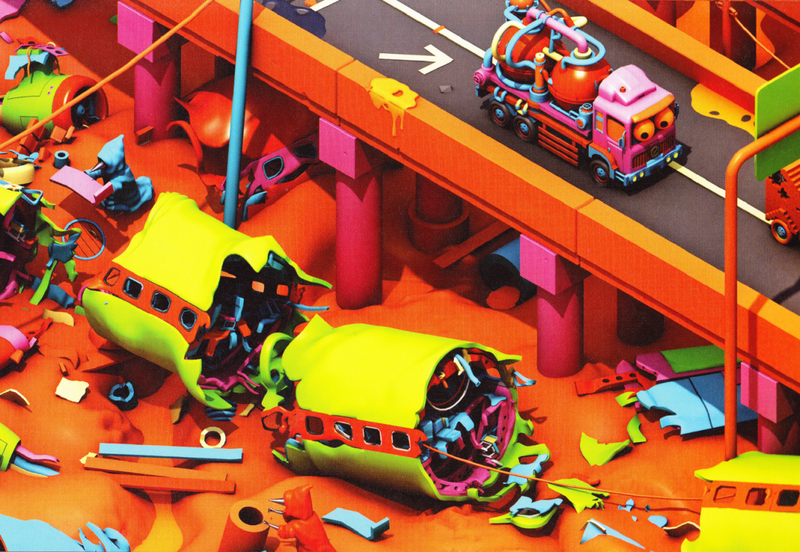 With attractive cartoonish computer-generated art, Speer constructs an alternate world that is cold and plastic. While much of QCHQ is a fantasy world, with its absurd creatures, vehicles, and dump trucks full of cones, cubes, and spheres, QCHQ also feels like an ode to the now. The effect is chilling. 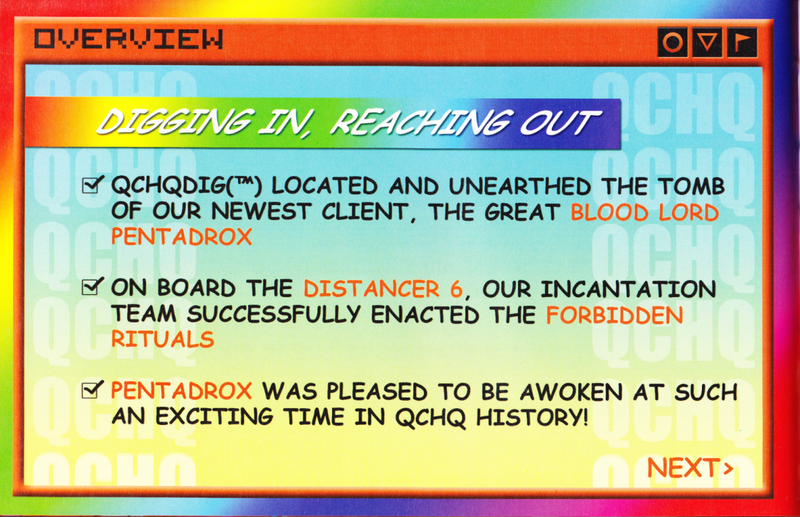 QCHQ was written by Jordan Speer (tumblr: jordanspeerart) and published by Space Face Book (tumblr: spacefacebooks). You can get a copy at their website.